In fall 2015 we worked with Nextility to build a rooftop project at Schernecker Property Services’ (SPS) Waltham headquarters. Nextility financed the project and entrusted us with its design and construction. 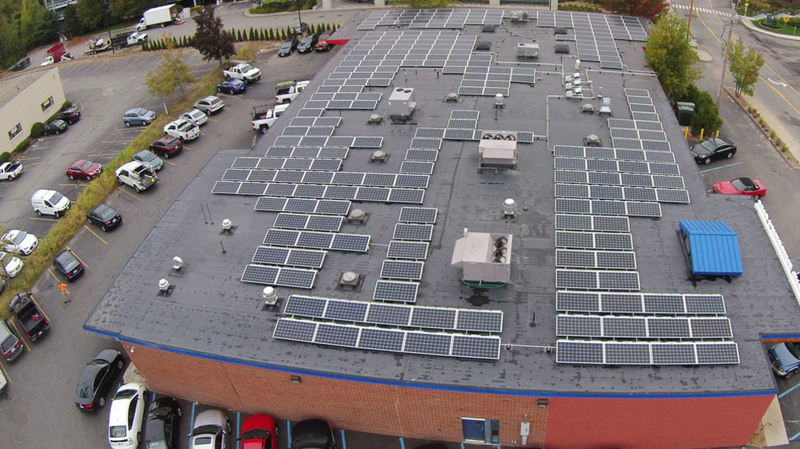 SPS expects to offset nearly half of its energy needs with solar, and save well over $100,000 in electricity costs over the life of the Nextility PPA.Obstructions throughout the roof required precise measurement for design, setup and construction. Multiple conduit runs connect the dispersed module groupings.During all phases of site work, Nexamp worked to minimize disturbance to operations at the property, which included not only SPS’ corporate offices, but also a veterinary clinic. We installed a generator that enabled the clinic to operate at full capacity for veterinary emergencies. Material handling and crane operations were also carefully coordinated for off hours of the property and neighboring businesses. SPS is committed to adding value to the properties and clients with whom we work. We are pleased with Nexamp’s installation process. With the advancements the solar industry has made, we anticipate strong performance at this location. Positive results should lead to wider adoption of solar by our clients on their properties.